Welcome to Nature's Splendor. Our mission is to provide you with the highest quality colloidal silver and essential oil products at prices that make sense. We have been servicing health food stores for over 20 years with nutrition knowledge. Most people work hard for their money and they should be able to purchase supplements that improve their health at reasonable prices. We work closely with our labs and suppliers so that we can deliver our products directly to the customer. We are able to keep our prices low by eliminating paying others to provide delivery services. Our customers benefit as a result because we pass the savings to our customers. Experience the difference! We Welcome customer reviews! We guarantee all of our products to your satisfaction! $12.95 Shipping on all orders over $38.95! 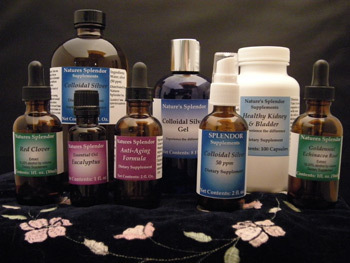 Contact Nature's Splendor for high quality natural supplements, aromatherapy products, colloidal silver and essential oils Citrus County Fl - Shipping Nationwide! Also available in 2,4,8,32 & 128 oz. Also available in 2,8,16,32 & 128 oz. Essential Oil - Almond 1 oz. Colloidal Silver Gel 4 oz. Essential Oil - Frankincense 1 oz. Also available in 2,4,8,16 & 128 oz.